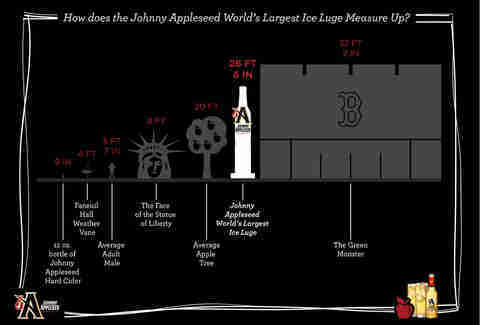 On June 19th, Johnny Appleseed is unveiling The World’s Largest Ice Luge right in the middle of Boston. Designed to kick off summer proper and drive home exactly how the hard apple cider's meant to be served (over ice! ), the luge will be a monster: 25+ feet tall, and weighing in at a cool 25,000 pounds. 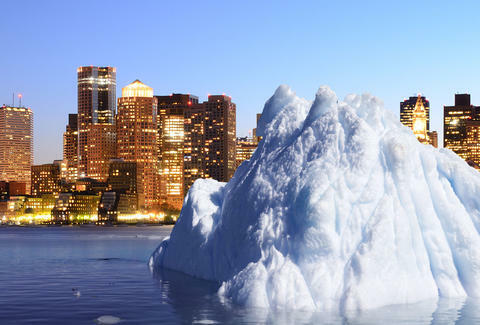 Nine ice carvers from the team behind the World’s Longest Ice Bar will build the beast on-site, using a crane and forklifts to move it into place. But the event surrounding this monument-raising isn’t just for crane operators -- this is a real, working ice luge that will pour you a glass of Johnny Appleseed. If you live in Boston or you’re planning on being there on the 19th, RSVP here for an evening featuring specials and promotions, a huge surprise musical guest (really, they’re internationally big), and the chance to experience a refreshing glass of hard apple cider that seemingly zig-zags from the sky itself. To give you a sense of what you’re in for (again, only if you RSVP), here's a graphic pitting TWLIL against other things, some of them very tall. Click to expand, because, in this case at least, bigger is definitely better.